Our leader, Barry Goldring, has done dowsing surveys for the National Trust in the past, and on Thursday 14th October he took a group of us to visit the terraced garden in Woodchester Park, courtesy of the Trust. Barry and another member had surveyed and dowsed this nineteenth-century garden a few years ago, but we wanted to fill in more of the details to help the warden, Michelle Oliver, plan the next stage in its development. Seven dowsers and five newcomers turned up, so we included some training into our visit. Peter Gibson led a group to get some more detail on the summer house ruin, originally a stone building in the form of a Greek temple. The rods indicated a pair of stone, lion-like beasts on plinths flanking the summer house, and a walled area with square flower and herb beds in front of it. One of our newcomers said she could feel warmth where she had been standing, and this was found to be one of a line of energy spirals located down one side of the walled area. Further down the garden, other members dowsed the site of a rectangular paved area that had previously been something of a mystery - what had it been used for? 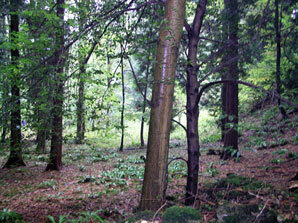 Silent secret places in the National Trust's Woodchester Park, where dowsing helps us discover the past. The usual garden features - statue, urn, seat - produced no response from our rods, but further dowsing indicated that it had been a stone sculpture, possibly of part of a tree, that could be used as a seat but not originally intended for that purpose. This needs more investigation. Too soon we were out of time, and were grateful for a lift back up to the car park in the National Trust minibus.